DVD examines how students of criminology research the effects that wildlife and weather cause on a body lost in the forest. How they collect evidence and organize factual presentations affect their preparations in a mock criminal investigation. Professors from the Forensic Science Department of the University of Central Lancashire teach forensics students scientific methods for unraveling the confused timeline of events involving a missing body in the forest. Fascinating DVD offers accounts of criminology students and their field studies in gathering physical evidence of a body lost in the forest. Realistic accounts examine the roles animals play as well as weather in scattering evidence over an area. Students must then properly gather evidence, identify it, and label it. Later they prepare for a mock trial by practicing scientific research, planning logical presentations of evidence, and reconstructing past events from the physical evidence at hand. From rigorous class work to mock courtroom presentation, viewers can observe students grappling with the challenges of criminology efforts from beginning to end. 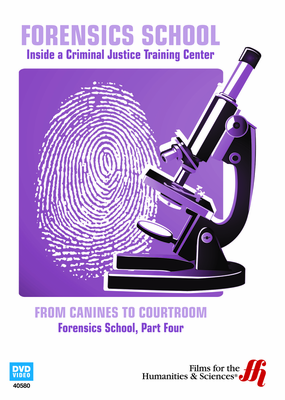 With the help of K-9 searchers and despite the scattering effects of scavengers, with the demands of careful scientific observation and professional levels of expert testimony, students of forensics face it all. Viewer Discretion is advised. Police dogs perform an important service, but they aren�t the only animal that can be used to track a crime scene. Wild animals and scavenging animals can also be used in crime scene forensics. This program studies how canines are used in crime scene investigations and how scavengers can influence crime scenes. The program shows coursework at the Forensic Science Department at the University of Central Lancashire. Forensics: Hair Evidence � Melanin is the pigment granules in hair, and there are two types of melanin: eumelanin and phenomelanin. Skeletal human remains can be spread over a wide area due to scavenging animals. Forensics: Skeletal Remains and Mock Trials � Students in forensics prepare for their upcoming day in court. Each student practices as a witness, one for the defense and one for the prosecution. After the mock trial is finished, their performance is evaluated. Two students look through a forest for skeletal human remains. Cadaver Dogs � Cadaver dogs are highly trained and follow the scent of decomposing human bodies. A dog is estimated to have a sense of smell that is 1000 times greater than a human being�s. Forensics Training: Dogs and Courtroom � Using pig flesh that is decomposing, dog trainers set up different situations for the cadaver dogs to find the flesh, and they are rewarded for finding it.